I hear this all the time and often it just means that people like to socialize but in the world of photographers it marks a pretty clear divide. You either like photographing people or you don't, it's quite simple. I enjoy engaging with new folk especially strangers, the variety of meeting different people and getting the chance to take their picture is what drives me as a PR Photographer in Hull. I don't like solitude so I can't spend my time trudging across the countryside looking for the next good landscape panorama, I have tried it and have produced some really nice images but I need to be able to talk to people so I don't specialize in it. Being relaxed with people isn't easy though and I think you have to have a certain temperament and a great deal of experience. I've being photographing people for a long time so I'm quite adept at reading folk and the situations they're in so when it comes time to encourage them into the pose you need or to react in a way that you know will work for a particular newspaper or magazine it's a skill more learned than taught, if that makes sense. I make my living as a Commercial Photographer in Hull so looking slightly beyond my enjoyment of the job I do I need to make sure that I'm focussed on what my client's needs are at all times. So whether I'm shooting for a feature magazine or a PR agency on one day then commercial products for a company the next I've always got their best interests at the top of my shot list. It's something else that comes with experience, knowing how my photography will help them achieve the best publicity for their campaign or show the best aspects of their product to potential buyers. More often than not I'm working with my clients as a specialist in my field providing advice where necessary to get the best out of the assignment. What has a lottery winner, a sumo wrestler and an opera singer got in common? Answer, nothing other than it's all in a days work for a PR Photographer! So i suppose the title is a bit misleading but it just highlights the variety of my life. I get to meet lots of different types of people and have a chance to be involved in their events. Their joy and jubilation is often infectious and you can't help but feel a part of it somehow, there's a degree of separation of course because you are commissioned to help in the publicity of their projects but i think if you didn't embrace what they were trying to achieve you wouldn't be able to show it in the pictures you create. Take this image of the girl winning a large sum of money, it didn't really need any creation...well, other than the confetti, the lighting, the crowds and being in the right place at the right time of course! This next image was actually to represent the new ownership of an agricultural machinery manufacturer but how many times have you seen the shot of three men underneath a company logo looking off into the middle distance? Ha, actually it's one of the shots i took and it was no walk in the park trying to turn three business men into catalogue models! 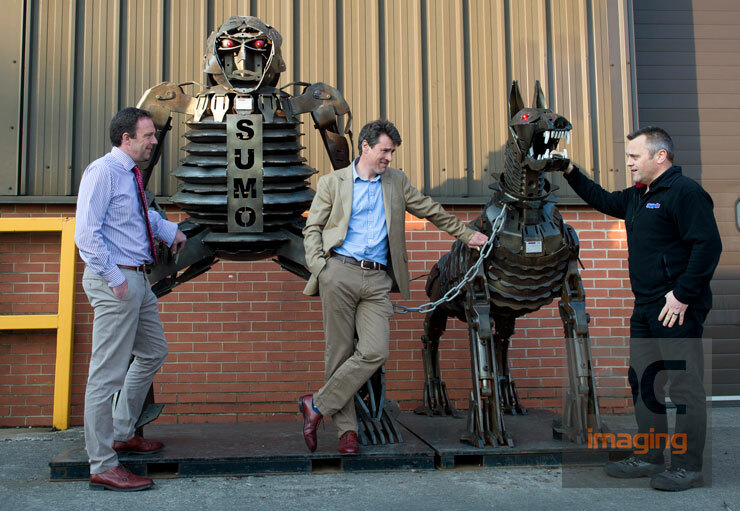 Luckily though this company were extremely proud of their metal sculpture of a Sumo Wrestler and his dog which represents the company very well and is part of the branding of the company so it had to be used. The simplest way to use it was just to get the men relaxing with it, no cheesy poses or reenactments of a sumo fight required, just an honest picture to show the two new owners and the previous owner who is staying with the company. This final job was a joy to photograph. The event was to mark a new partnership between Hull University and Opera North, mainly a networking business event but in between speeches and networking were performances from two opera singers. I've never been to the opera and quite frankly this was one time i was glad of the barrier the camera can create, the emotion generated from such wonderful singers was a bit over whelming as i listened and watched before i was able to get the image i wanted for the client's publicity.